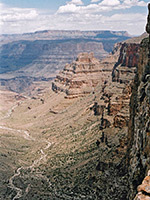 There are various ways to reach the Colorado River in the western Grand Canyon, traveling across the undeveloped land of the Hualapai Indian Reservation, though most involve trailless cross-country routes. By far the easiest is along Peach Springs Canyon, as this has a good quality gravel track running right to the river's edge. 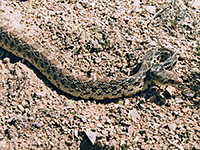 One other tributary with a recognized trail is Bridge Canyon, 10 miles further west, though the way is not so straightforward as to reach the river from the main highway (US 66) requires driving 6 miles along the unpaved Buck-and-Doe road and 9 miles on a less used dirt track, walking 5 miles further and finally hiking 4 miles down a steep, little-used path and later a streambed. But despite this area being very remote and almost never visited, it is easy enough to explore. A permit is needed for hiking and camping on Hualapai land, and this can be obtained from the Hualapai Lodge, on US 66 towards the west side of Peach Springs. From the lodge, the turning for the Buck-and-Doe road is a short drive westwards. Six miles along this road, just after a cattle grid and 0.4 miles beyond some powerlines, an unsignposted track branches off to the northeast, crossing a flat, treeless plain, past an airstrip and radio tower, and arriving at a small reservoir after 5 miles. 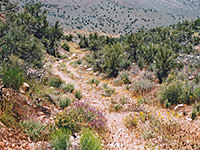 The road then forks; the right branch is narrow and not often used, but passes more empty land that becomes a little more bushy and uneven as the track approaches the rim of Hindu Canyon, one of the main tributaries of this part of the Colorado River drainage. The route continues for 12 miles - down into this canyon, up the far side and across a plateau to a viewpoint directly above the river - though the track becomes rough as it descends from the rim so most people will want to park and hike from here. 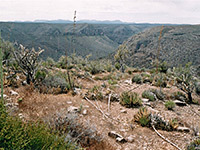 The old track winds down the south side of upper Hindu Canyon to the valley floor and the usually dry streambed that runs through it. The scenery here is not very Grand Canyon-like, as the hillsides are rounded and grass covered, without any exposed cliffs or terraces, though the underlying rocks do become exposed a few miles downstream. The route crosses the stream, climbs a little to avoid a short rocky section, drops back down then turns away due north, up the far side of the valley. A walk further downstream leads, after another mile, to the slot canyon at the lower end of Hindu, but the main route ascends 400 feet, across a long-since washed out section that makes the way ahead impassable for any vehicle, up to a ridge separating Hindu from Bridge Canyon, the next ravine to the north. In spring, all of the track has abundant wildflowers but especially so on the south-facing slopes of this section. The track forks on the ridge; the left branch climbs gradually another 500 feet then is almost flat for 6 more miles to the lookout point high above the Colorado, while the right fork follows a small ravine at the head of Bridge Canyon and switchbacks down the Redwall cliffs that start abruptly just beyond. This trail is very steep for a mile, dropping 1,200 feet, falls more gently over the next 2 miles as it reaches a plateau right above the inner canyon gorge, then follows a bench for some distance westwards, as far as Separation Canyon, where it descends to the Colorado. But the river can be reached sooner by continuing down the streambed of Bridge Canyon, not on any trail, but the way is without obstructions. A good view down Bridge Canyon and across red cliffs beyond is obtained from a yucca-and cacti-covered limestone hill just east of the trail. 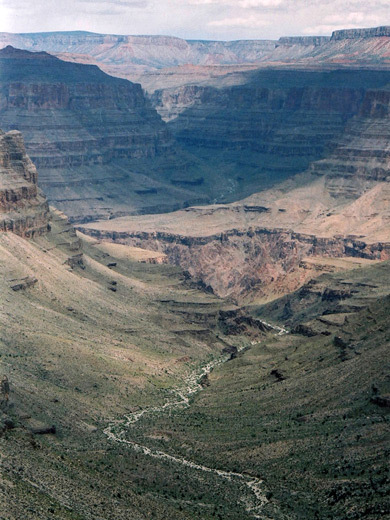 Bridge Canyon was the proposed location for a dam to be built across the Colorado River. This unlikely idea was investigated for over 20 years before being finally defeated by public opposition in 1968. In 'A Survey of the Recreational Resources of the Colorado River Basin', published in 1946, the NPS outlined plans for a highway to be constructed from US 66, along Hindu Canyon, though a 4,000 foot tunnel and down to the dam site via Bridge Canyon, but there is now no prospect of any development at this site or anywhere else along the Grand Canyon nearby.